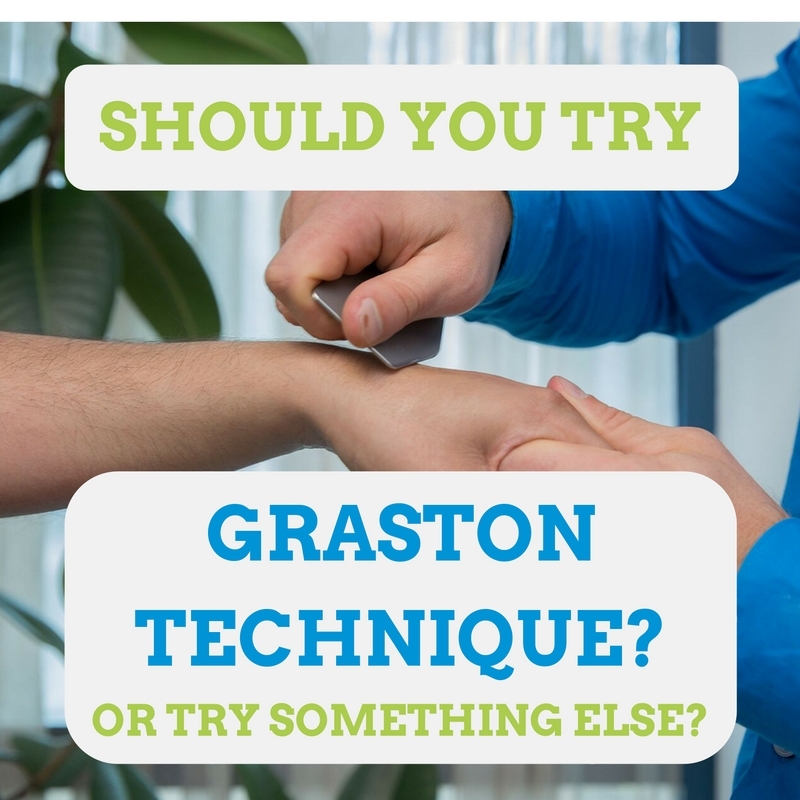 Home » Should You Try Graston Technique? If you’re reading this about Graston Technique, you’re probably an athlete who wants to increase performance and/or have been in pain for a period of time and you’re seeking better pain relief from some unconventional treatment. If you’re either one, you’re in the right place. Where Graston Technique can work really well. Where Graston Technique is completely ineffective. If You Should Try Graston Technique or Not. What You Should Expect if You Try Graston Technique. Graston Technique is an instrument-assisted soft tissue manipulation technique (IASTM) started in 1994. Don’t get confused by the acronym IASTM. IA – Instrument-Assisted means the provider is a using a tool other than his hands. Below are the Graston Technique instruments. ST – Soft tissue typically means in and around muscles, which are soft. M – Manipulation means touching and moving the muscles. Graston Technique was originally designed by athletes, for athletes, to address scar tissue and fascial restriction for the purpose of increasing range of motion and ultimately, fixing pain. Fascial restriction means when the fascia is not able to move. Normally, fascia stretches, slides, and is quite movable. 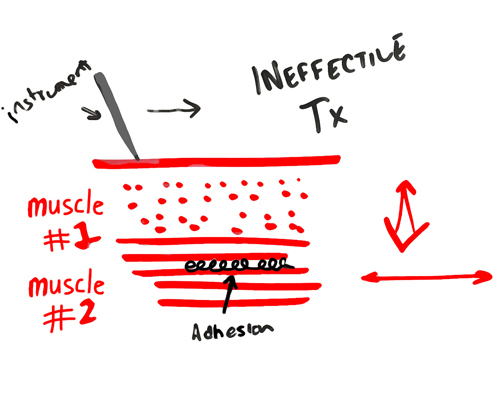 Going forward, I will use the term adhesion to identify what Graston Technique is treating. If you were to experience Graston Technique yourself, the provider would have you either be still or move as he is treating you. He would glide the tools over your body, looking for adhesion. When he finds adhesion, he would continue to glide the tools over your body for a series of passes, with the purpose of breaking up the adhesion. In doing so, the intent is that you experience less pain and increased flexibility. If you’re going to try Graston Technique, you should know where it can work really well. That means you need to understand a few principles of IASTM techniques. Without understanding of these principles, you could fall prey to the technician who only uses Graston technique and no other tools. Your potential for pain relief would have an artificially low ceiling. Here, I’ll outline the principles. 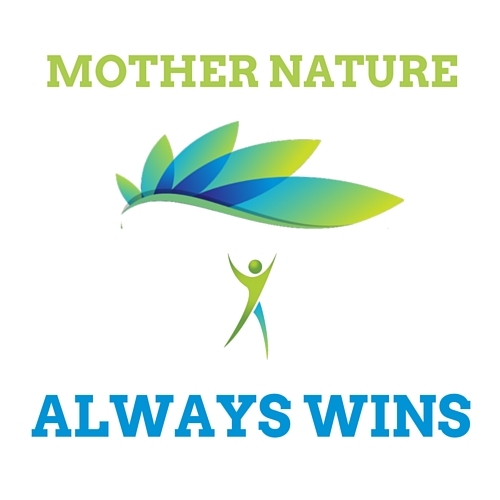 Below, I’ll dive into more detail so you own these concepts and can challenge your provider if they’re breaking any of Mother Nature’s rules. LOCATION: The adhesion must be less than 1″ away from the skin. (If the provider is trying to Graston your psoas through your intestines, run!). 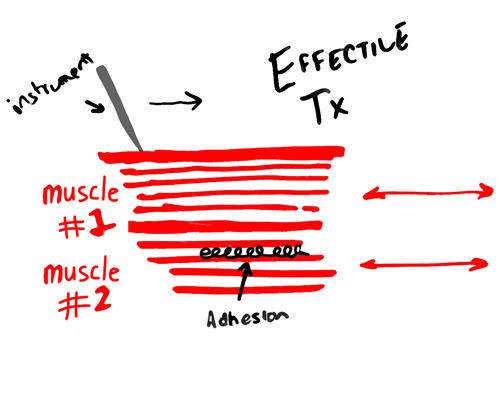 MUSCLE FIBER DIRECTION: All muscles fibers closer to the skin must be parallel to the direction of the muscle where the adhesion lies. PRESENCE OF FAT: There should be minimal superficial fat on between the skin and the adhesion. TREAT PROBLEM AREAS ONLY: The instrument should only be used where the the instrument is vibrating as the adhesion catches on the tool and/or a sound is made as a product of effective treatment. In other words, the provider shouldn’t spend time treating already healthy tissue. This might surprise you that it has to be said at all. But it does need to be said. Below is a list of areas where IASTM techniques (including Graston Technique) work really well. Don’t be confused by the terminology of body parts. I simply intend to distinguish between what is treatable vs. not treatable in nearby locations. This distinction is important because many providers will shotgun an area, claiming that every body part is treatable with an instrument. In our practice, Barefoot Rehab, I have found this concept to be false. If you’re currently being treated with Graston Technique and you don’t notice any changes after 3-5 visits, feel the instrument working, or hear a noise that it’s working, you should question the provider. 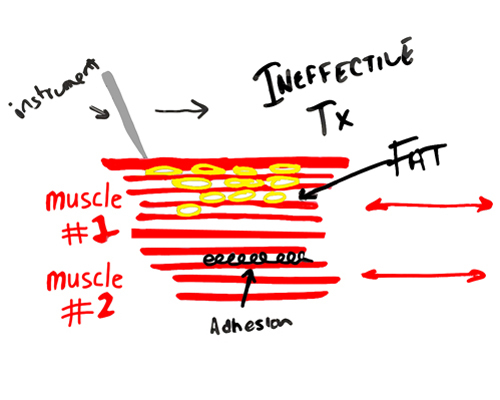 For treatment to work in muscle #2, all of the muscle fibers in muscle #1 must go in the same direction. In the image below, notice that muscle #1’s fibers are moving towards you while muscle #2’s fibers are running parallel to the screen. This is a recipe for ineffective treatment. Treating your mid-back muscles with an instrument is ineffective due to this phenomenon. But treating your forearms, where the muscles closer to the skin run in the same direction, is a recipe for effective treatment! When there’s fat in the way of the adhesion, treatment will be ineffective. The fat phenomenon is the reason why the 30 year-old female with hip pain on both sides got 24 treatments of Graston technique with no improvement. Imagine you have cancer. If there were a treatment that removed only the cancer cells and left your skin, hair, energy level and immune system, untouched, would you want that treatment? When it comes to removing your adhesion, there are ways to remove only the cancer and leave the rest of your body healthy. Unfortunately, many providers today are still “shotgunning” the area of complaint, hoping to get the problem area, damaging healthy areas at the same time. 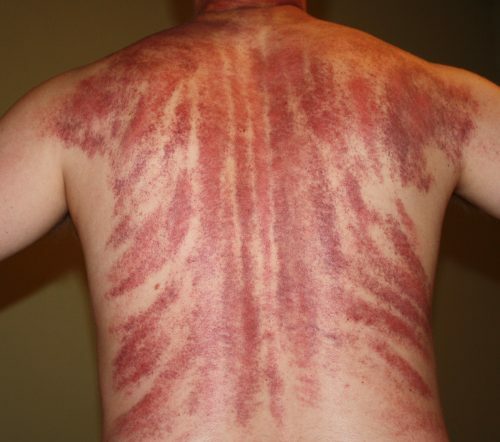 The Chinese gua sha treatment is known for the bruising observed below. A qualified adhesion provider will remove only the dime-sized adhesion in a specific spot using the Test-Treat-Retest methodology before continuing. If your problem area looks like this guy’s back, you deserve better. The list of effective treatment locations above includes some areas that are ineffective. The distinction of what is treatable with Graston Technique (or other IASTM techniques) vs. isn’t is extremely important. It determines the difference between you spending hundreds (if not thousands of dollars) and hours of time/wasted energy vs. getting out of pain rather quickly. The doctor who gave one of our bilateral hip pain patients (the pain was present for 8 months before seeing us at Barefoot Rehab) 24 treatments of Graston Technique to her groin muscles had the right diagnosis. See the case study below (5:26). Her adductors were one of two primary problems. However, the groin is completely ineffective with Graston Technique due to Principle #3 – the presence of fat. Three treatments of Manual Adhesion Release to her adductor magnus and posterior hip capsules and this patient noticed a dramatic, sustainable difference in her hip pain. Three treatments of 80% improvement vs. Twenty-four treatments with 0 % improvement. Choose the right practitioner wisely. I’ve heard legends that providers will “attempt” to treat the psoas muscle with an instrument. 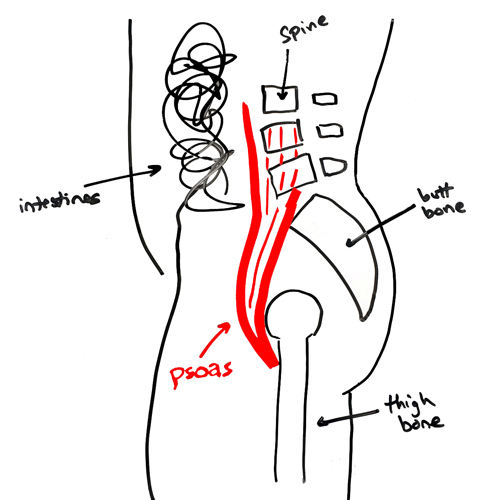 Not only is the psoas sometimes 3″, 5″, or even deeper depending on how much body fat a person is storing in their abdomen, but their are intestines in the way. The instrument “blade” is sharp enough to tear adhesion close to the skin. Deep to the intestines and the belly fat, the instrument has ZERO chance of treating the adhesion present in the psoas. you can find your pain on the list of structures where Graston Technique works really well. If you aren’t being helped yet, find a provider of Graston Technique. the location of your pain is on the list of structures that are completely ineffective. 30% of the time, we use the instrument designed by Dr. William Brady of Integrative Diagnosis. This is the gold-standard treatment for adhesion in specific areas of the body. 70% of the time, we use our hands with Manual Adhesion Release (MAR) or Active Release Technique (ART). MAR is the gold-standard treatment for adhesion where an instrument is ineffective. If you want to find the best provider possible to meet all of your chronic pain + adhesion needs, I recommend you find an Integrative Diagnosis provider. There aren’t many of us out there. But if you’re lucky enough to live near one, ID Providers are training to humble themselves to do whatever a person in pain needs. The goal is that patients don’t become pigeon-holed into treatments that a doctor uses on every single patient who walks through the office. If you don’t live near an ID Provider, then do the best you can patchworking different providers based on your knowledge of your pain. 1. The pain should be reduced at least 10% in five visits or less. If your pain isn’t reduced, something is wrong. Even if you’ve had the pain for a long time. Regardless of the reasons, your cue at visit 5, if you don’t have results yet, is to ask your provider how the plan’s going to change moving forward. If he doesn’t sound like he knows what he is talking about, find another provider. 2. During the treatment, you should hear grinding and see micro-bruising (known as petechiae). Be weary of the instrument holder who paints your arm pink. You want to damage the sick tissue, not the healthy tissue. 3. Your flexibility should be immediately increased after the treatment and permanently increased after five treatments. When your flexibility (or range of motion) has increased, you know that the adhesion responsible for your tightness has been removed. If your tightness stays the same, whatever the problem is that is causing your tightness is still in your body. This doesn’t mean that your pain can’t decrease if your range of motion stays the same. 4. Your treatment plan should involve more than Graston Technique. Avoid reductionists at all costs. A reductionist is a provider who reduces everyone’s problems to their specific solution. If your provider is only delivering Graston Technique with no other solutions, a red flag should go up in your head. With this information, you are now empowered to judge for yourself, as a patient and client, what type of care you should be getting for your pain. Unfortunately, we cannot trust our healthcare systems, the government, or even individual doctors to be an advocate for our most pain-free selves. Being empowered means less pain in your body, more money in your pocket, and more energy to live the life you dream of. Read The 7 Biggest Mistakes People Make When Choosing a Pain Doctor to save yourself some trouble. What has your experience been with Graston Technique? Did it work completely for you? Did you make you 50% better, only to need a hands-on treatment for the rest of your resolution? Feel free to share with us. I’m a non-athlete with stupidly huge, tight calf muscles (aka muscle imbalances galore) and suffered for a couple of years with Insertional Achilles Tendinopathy. Tried everything under the sun minus surgery, including multiple doctors and a 3 month stint in a walking boot. Nothing worked. A runner friend of mine recommended a physical therapist. I didn’t realize when I scheduled the first visit but he was also skilled in the Graston Technique. It was not pleasant feeling and sometimes painful – never bruising but it worked – along with a full regimen of stretching key muscles from the back down to my toes. My insurance cut me off before getting to the muscle strengthening portion of the therapy unfortunately. The only thing I would say is for me, it took longer than 5 visits for me to really feel the improvement in a significant fashion. Actually long after my insurance stopped me from going – my condition continued to improve slowly over many weeks. I still have the issue but I am completely back to all my normal activities without pain and I feel quite certain the Graston technique was largely responsible for my improvement. Hi Sue! I love to hear when people get care that produces results! Especially after trying “everything under the sun”. You are lucky to have found your PT who did Graston on you. So many people don’t get the right treatment for their specific problem. And yes, the Achilles is a spot that responds well to an instrument assisted technique like Graston! I’m curious though. What’s stopping you from strengthening yourself? Had physical therapist use this technique after shoulder injury.MRI states tears in 3 diff areas and fraying on cuff. Day after graston I am in severe pain ,more limited motion and more popping sensation in shoulder area. I’ve had MRI. Spec. Dr says hurt shoulder MRI report states tears and fraying? Hi Dyna, if you have tears in 3 different areas, you probably need surgery. Surgical problem –> Surgical solution. Surgical problem –> Graston is not an equation that makes sense. Do you understand this? Blindly getting Graston on tissue is like shooting in the dark. It doesn’t work. Not to fail to mention that no doctor can use instruments on shoulder problems because the tissue can only be treated with the hands in that area. Hope this is helpful. I have had early fibrosis set in my neck and right shoulder four months after radiation treatment to the same areas post tumor resection. Plus scarring surrounding plastic surgery for a flap. I found a chiropractor with a decade plus experience in Graston. After six visits the fibrosis, caused due to haphazard laying of collagen, has been reduced by a good 35-50% depending on area. My neck, which had been super tight, like stretched out leather, is now much more supple and my ROM is better. I give two thumbs up for Graston Technique…..three if I could! I plan on staying the course for a good six plus months. Hi Dave, thanks for the comment. I’m happy to hear Graston is working for you. Sounds like you’re getting the treatment you need. Good stuff. I experienced a full achilles rupture in 2010 and had it surgically repaired. I went through a lot of physical therapy, including massage, and was back to normal activities within a year, I experience some tightness and pain every now and then but recently, I’ve been experience more discomfort, particularly in the scar area where I definitely have some scar tissue adhesion (when I flex my foot, the tissue “catches”). I would like to explore the Graston technique but quite concerned of the pain it might cause — even thinking about the pain I experienced from the injury makes me dizzy. How concerned should I be with that considering this is directly on the point of rupture and scar? Hi B Wakley, Graston or any instrument technique can be helpful to remove scar tissue on the achilles tendon. The less your achilles is overloaded, the less painful it will be. So try to rest as much as possible prior to treatment (4-7 days would be ideal). The less your knee to wall test (6″ is full), the more likely you’ll also need hands-on treatment to the deeper calf structures. Graston can not treat those structures – they’re too deep. I have tried almost every thing for what appears like plantar fasciitus. X-Ray, MRI, 4k in custom orthotix, three podiatrist, electroshock therapy, Tennis ball, stretches. The Graston Technique is my last option before a plantar fasciatomy scheduled in August. I am not sure if this will even work I have given up. One of the main symptoms of plantar fasciitis is pain in the morning. I do not have pain in the morning. I have pain anytime I stand for more than 10 minutes which increasingly gets worse. Is this a technique you think will work? Hi Skyles, I’m sorry for your struggle. Can you tell me exactly what the MRI says on the report? Has anyone told you the importance of rest with treatment? Usually, “plantar fasciitis” is a combination of inflammation and degeneration (plantar fasciosis). Plantar fasciITIS does not have to have pain first thing in the morning. Hello! I experienced an ankle sprain in October 2017 while trail running. Urgent care had me booted one week. My foot dr subsequently agreed and said it probably needed 6-8 weeks of rest. Fast forward to week 12 I still can’t run a mile. This led to me getting a MRI which showed grade 2/3 tear sprain patterns on two tendons on the outside on one tendon on the inside. Everything major that wasn’t torn had tendonitis along with some bone bruising. Podiatrist then had me booted for 9 more weeks. I then started PT for 5 weeks where I had significant improvements and was able to start running again. After building up for 6-8 weeks I managed a few 25 mile weeks. The swelling was always present and sometimes the ankle would be sore. I then sprained my calf. After about 3.5 weeks off I tried doing a few miles and have substantial ankle pain on the tendons running across the inside ankle bone (same one that was torn). The outside still swells daily as well. I have scheduled a PT appointment this coming week with a provider who specializes in Gratson. I am hoping the problem is excess adhesions that can be batttled! Anything I should consider specific to this type of injury above and beyond what you noted in the article? Hi Brad, yes, there are. Graston works really well for the bottom and top of the foot, as well as the peroneal muscles and the achilles tendon. Graston works horribly for the tibialis posterior, flexor digitorum longus, and flexor hallucis longus muscles as well as the ankle ligaments. Be aware that you’ll need instrument treatment AND hand treatment, especially if your Knee to Wall Test (https://www.barefootrehab.com/know-your-numbers-ankle-pain-foot-pain-and-ankle-dorsiflexion/) is restricted. The more restricted that test is, the more you’ll need hands-on treatment to get your range as close to 6″ as possible. Thanks for the response. I tried the test you mentioned and on the injured foot it’s about two inches. The “healthy” other side is about 3.5 inches. Seems there is work to be done here! Yes! This is really good stuff. Yes, there’s a lot of room for improvement, which is a good thing. If you had 6″ and bad pain, it would be probably structural damage (that isn’t fixable without surgery). So, any stretching or myofascial work you get done should make a difference on this test! Hi Shreya, Graston is one tool that would be used in a treatment visit to break down adhesion. The session to break down adhesion should last about 10 minutes. I recommend 4-5 treatments with a goal of noticing some percentage of permanent relief (i.e. 25% decreased pain). I got a prp injection for patella tendonitis that unfortunately made things worse. I’m sure I pushed too much too soon but nevertheless, I’m still trying to resolve the tendonitis 4 yrs later. I’m addressing some real quad dominant imbalances that got me here and getting manual therapy from a PT. Small little red swelling and pain where I got the prp injection that flares up after graston but seems to be getting smaller and less severe. Sound like normal improvement? Has about 6 or sessions. Hi Ian, as a general rule of thumb injections INTO tendons further degenerate them. You likely have some tendinosis due to the injection. Now, you know. Yes, sounds like the adhesion in the tendon is improving. Graston can be used for the patellar tendon, knee joint itself, and superficial quad muscles. They will need to use their hands for the deep quad. Also, make sure all of your other low back ranges of motion (ankles, hips, straight leg raise, etc.) are as close to full as possible (esp. if you want to get back to activity). The most restricted test is the one that should be focused on first. If your hamstrings are extremely tight, make sure they focus there.